I think that sports are awesome for kids. They’re fun! The kids get exercise, make new friends, learn about competition and trying your best, and lots of other life lessons which I am constantly repeating to my children to the point of annoyance. “It’s not over ’til it’s over!” “Today is a new day!” Love those. Mr. Picky is 10 years old and he will basically play as many sports as his schedule and we will allow. I can’t possibly let him participate in everything that strikes his fancy because then I would truly have no life and he would be exhausted. He plays soccer all year plus basketball in the winter, baseball in the spring and tennis in the summer. But can I just vent for one second? Soccer, basketball, tennis — all good. Normal practice schedule. Short games. Love it. 10-year-old baseball? T-O-R-T-U-R-E. Seriously, I would have offered him a THOUSAND dollars not to play and I honestly think he would have turned it down. Drat. So, if you follow me on Instagram, Facebook or Twitter, you know I post my family’s dinner every night. I won’t promise high quality images, just the real deal. But you should start expecting slow cooker meals and/or soups and stews on Thursdays for the next 2 1/2 long months. Games are from 5:30 – 8:00 pm and I don’t expect my daughters to wait until 8:15 to eat (or at 4:30 for that matter.) So I need something that can stay warm for a few hours without drying out. I know the first day of spring is this week and I couldn’t be more thrilled. But let’s face it, the temperature doesn’t all of a sudden go up by 15 degrees on March 21st. Soups are still in play! (That was a cheesy pun, but I couldn’t resist.) 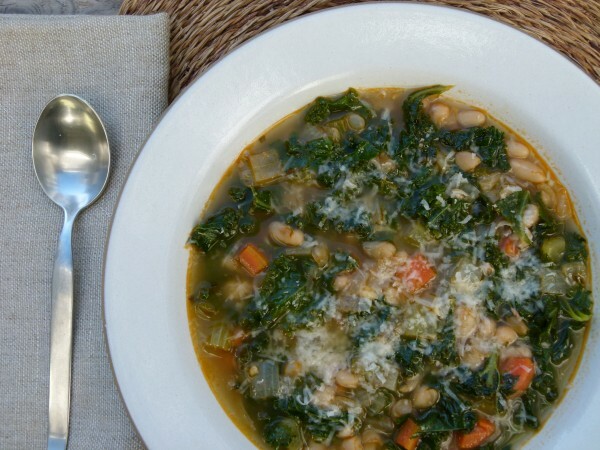 I love, love, love this kale and white bean minestrone. 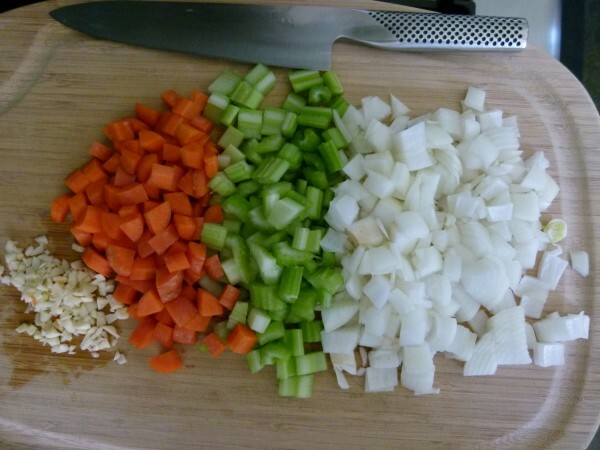 I taught this soup in my classes last month, but I have been making a version of this forever. It’s hearty and flavorful, but still light since it’s all veggies and beans. I make it with chicken stock very often, but also with vegetable stock. Sometimes Mr. Picky and I will eat something before the game like peanut butter toast and then have a bowl of hot soup like this when we get home. Really hits the spot. Because the beans add great protein, I’ll also reheat leftovers for school lunch the next day. 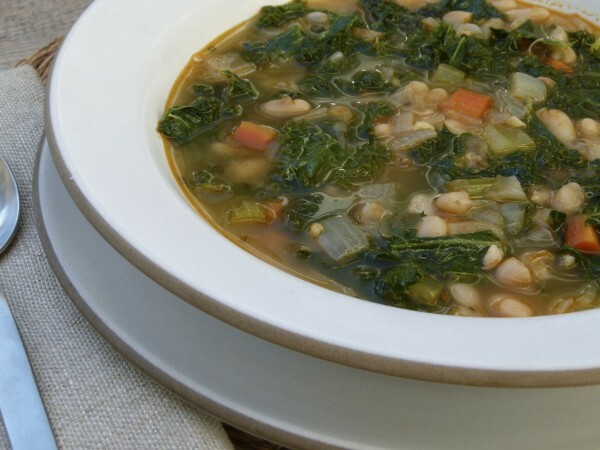 I think kale is amazing in this soup, but I have also made it with Swiss chard and I think collards would be great, too. Sometimes I’ll add a little extra tomato paste to make it more tomato-y. 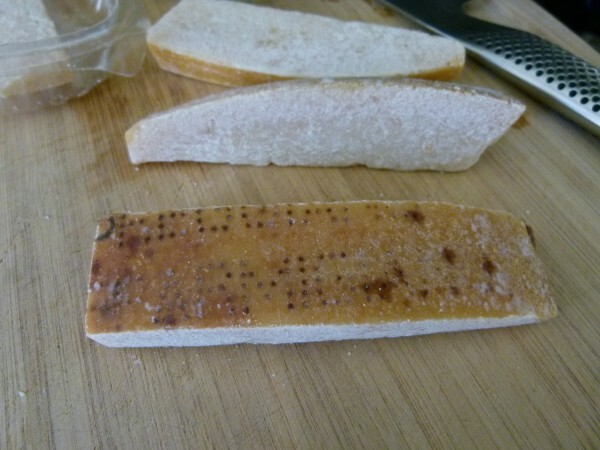 But I almost never make it without my secret ingredient, a rind of Parmesan cheese. This makes this soup so flavorful and rich without you actually eating cheese. Although I can never resist grating some fresh Pecorino on top. Sadly, I think many of you are bracing for another snow storm. This soup’s for you! Warm oil in a large pot over medium heat. 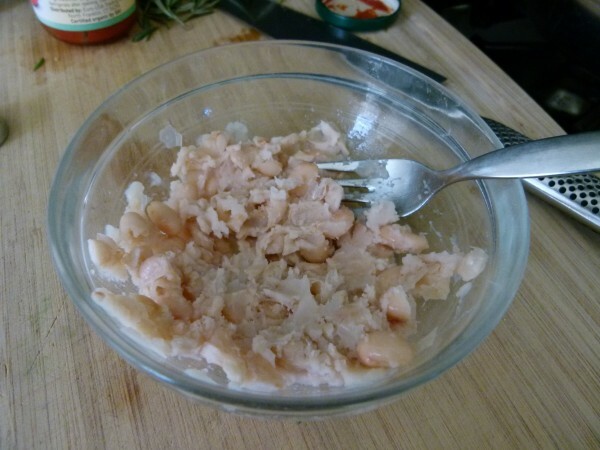 Add chopped onion, carrots, celery and garlic and sauté until tender and translucent, about 6-8 minutes. 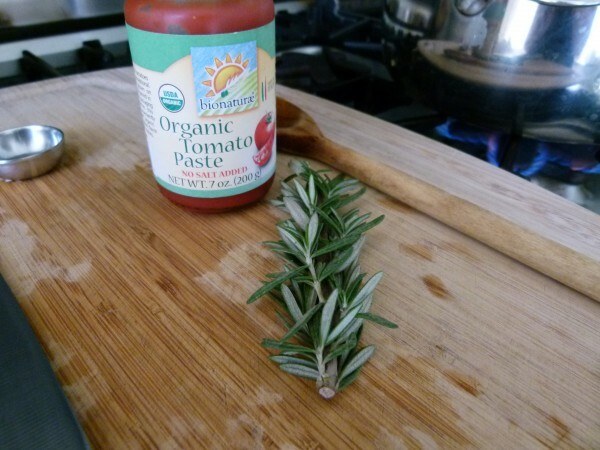 Stir in the tomato paste and rosemary and cook for 2 minutes, or until fragrant. 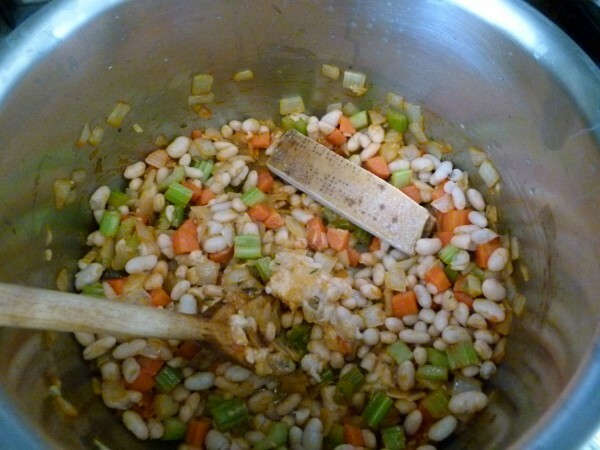 Add the white beans, salt, pepper and parmesan rind. Try to mash a few of the beans in the pot. This will help thicken the soup later. Pour in the stock. Raise the heat to high and bring soup to a boil. Lower heat so that soup gently simmers and partially cover the pot. Simmer for 20 minutes (or longer if you want), or until vegetables are tender. Stir in kale leaves and simmer another 8 minutes or until kale is tender. Taste for seasoning and serve with or without desired accompaniments. *Or you can use 1 can of beans and 1 pound of chopped Yukon Gold potatoes. **If you use Swiss chard, separate the stems from the leaves before starting the recipe and chop both. Sauté the chopped stems with the onions and add the chopped leaves at the end. Hi there! From the photos it looks like you mash the white beans slightly but this isn’t in your instructions (it just says to drain and rinse. Which do you prefer? Yes, drain, rinse and in Step 3 the instructions say to mash slightly against the side of the pot. You can do it before you add them to the pot as well. Enjoy! 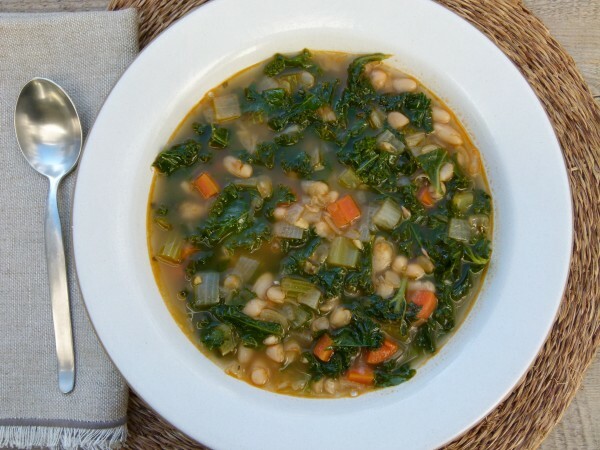 I love this healthy hearty soup! I’ve made it for family, I’ve made it for friends and everyone has liked it. An easy go to soup. Thanks, Suzi! It’s a family favorite around here! Another success on a meatless meal! So delicious. Thank you! My family is really benefiting from your weekly menu posts. I’m sooooooo happy about that! Can you substitute sweet potatoes for potatoes in this recipe? This is a go to soup for us:) Thx!! Do you mean can you sub sweet potatoes for white beans? There aren’t any potatoes in this recipe. I don’t see why you couldn’t. Just make sure you cook them until tender. What I loved about this soup was it was so easy to make and the ingredients would be things I would already have in my pantry. I really liked how creamy it got with the cheese rind in it. I took your suggestion regarding the extra pizza but I had whole wheat pita bread instead of naan and I just made them with red sauce and cheese. Thank you for another delicious meal! Can you use lentils instead of beans? Thx!! made this last night & we loved it so much i’m making a huge batch today to freeze. Thank you always , Pamela ! 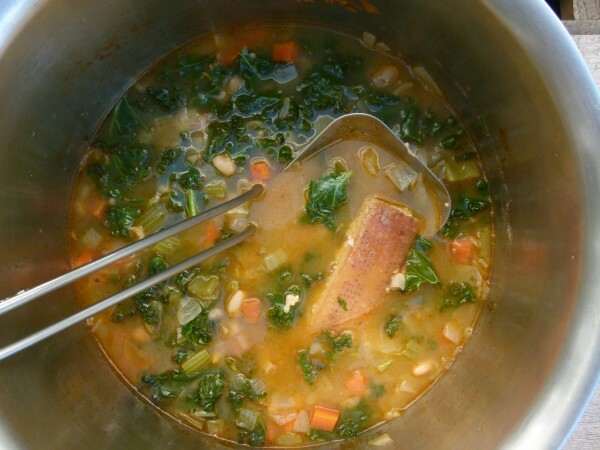 Hi Pam – You are right – still a bit chilly and soup is so appropriate right now! Love to hear your stories about your family. This one was so darling! And, by the way, I hear swim team is a nightmare too – meets are very, very long! (Never had to endure that!) Keep the photos the real deal! I like it that way! How sweet are you! Thank you, Lori!